Some interesting points from the recent Bowker Reading industry survey. I would love to post more, but I found myself short the $999 they are asking for the report. When I say short, I mean: there is no way I’m paying a grand to get a report when I could be using that money to buy another guitar. Now this is an interesting study and article. I have actually noticed this phenomenon myself when looking for crime and thriller authors and books from various generations. Everyone knows Robert Howard, Raymond Chandler and Donald E Westlake, they’ve pretty much stayed in print since they were released. But what about the other authors from the 1920s to the mid 1980s? 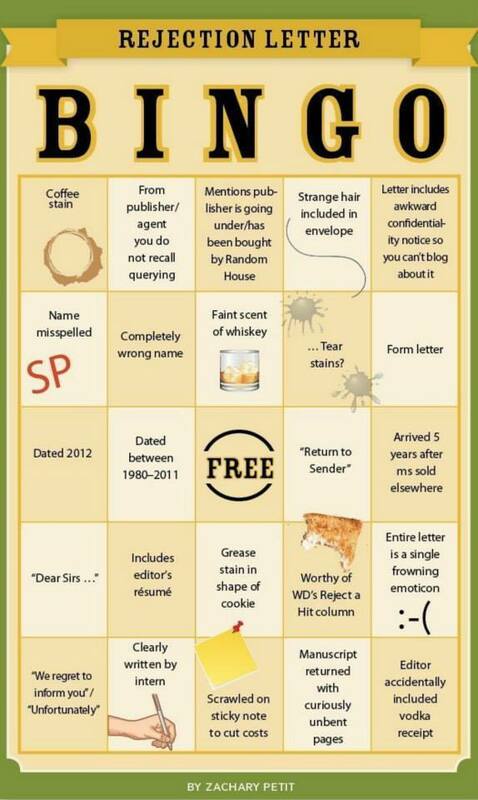 On various writer forums you will find writers re-releasing their novels from the 80s as ebooks. This is the downside of copyright. Read for this article I stole am re-blogging from The Atlantic. Last year I wrote about some very interesting research being done by Paul J. Heald at the University of Illinois, based on software that crawled Amazon for a random selection of books. At the time, his results were only preliminary, but they were nevertheless startling: There were as many books available from the 1910s as there were from the 2000s. The number of books from the 1850s was double the number available from the 1950s. Why? Copyright protections (which cover titles published in 1923 and after) had squashed the market for books from the middle of the 20th century, keeping those titles off shelves and out of the hands of the reading public. Heald has now finalized his research and the picture, though more detailed, is largely the same: “Copyright correlates significantly with the disappearance of works rather than with their availability,” Heald writes. “Shortly after works are created and proprietized, they tend to disappear from public view only to reappear in significantly increased numbers when they fall into the public domain and lose their owners.” The graph above shows the simplest interpretation of the data. It reveals, shockingly, that there are substantially more new editions available of books from the 1910s than from the 2000s. Editions of books that fall under copyright are available in about the same quantities as those from the first half of the 19th century. But even this chart may understate the effects of copyright, since the comparison assumes that the same quantity of books has been published every decade. 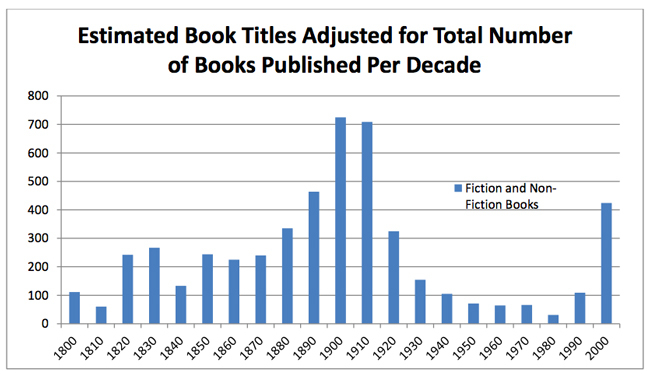 This is of course not the case: Increasing literacy coupled with technological efficiencies mean that far more titles are published per year in the 21st century than in the 19th. The exact number per year for the last 200 years is unknown, but Heald and his assistants were able to arrive at a pretty good approximation by relying on the number of titles available for each year in WorldCat, a library catalog that contains the complete listings of 72,000 libraries around the world. 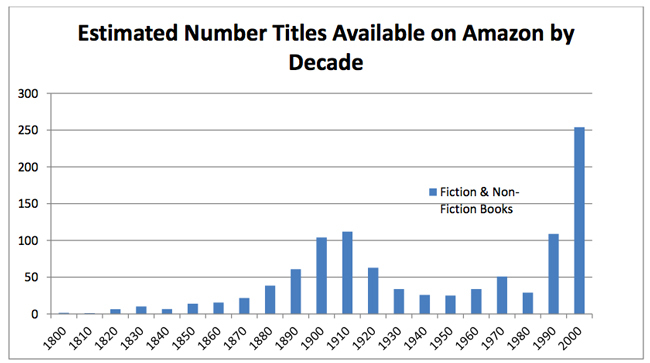 He then normalized his graph to the decade of the 1990s, which saw the greatest number of titles published. By this calculation, the effect of copyright appears extreme. Heald says that the WorldCat research showed, for example, that there were eight times as many books published in the 1980s as in the 1880s, but there are roughly as many titles available on Amazon for the two decades. A book published during the presidency of Chester A. Arthur has a greater chance of being in print today than one published during the time of Reagan. 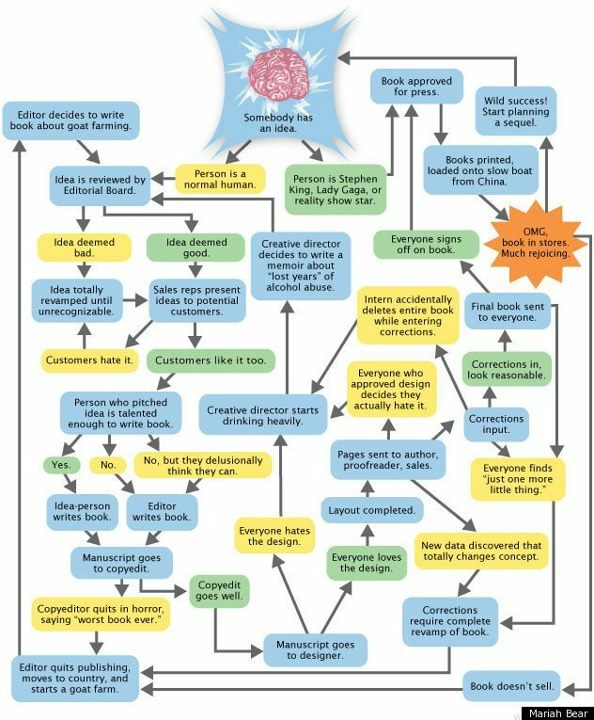 Copyright advocates have long (and successfully) argued that keeping books copyrighted assures that owners can make a profit off their intellectual property, and that that profit incentive will “assure [the books’] availability and adequate distribution.” The evidence, it appears, says otherwise.